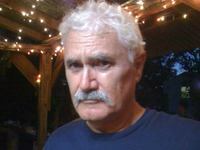 My name is Andrew Joyce and I write books for a living. 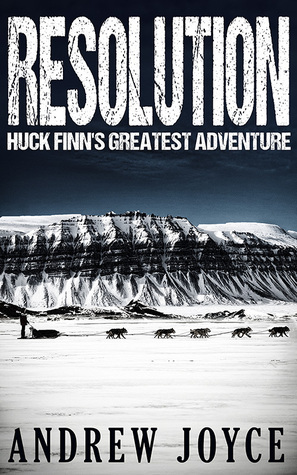 Johanna has been kind enough to allow me a little space on her blog to promote my new novel RESOLUTION: Huck Finn’s Greatest Adventure. I think it’s a good book, but what do I know? Anyway, I’m kinda shy about tooting my own horn. So I think I’ll turn things over to my dog Danny—Danny the Dog. He always has an attitude and usually does not speak highly of me. But please understand that we co-exist as the old Soviet Union and the United States once co-existed. We tolerate each other. So without further ado, here’s Danny. Andrew took me away from some very important business of mine to help him out here. There was a duck outside the boat we live on and I had to bark at him. It’s my job. Now on to the reason why I was so unceremoniously dragged here: For a person who works with words for a living, Andrew has very little to say in real life. He wants me to tout his book for him, but I don’t think I will. Instead, I think I’ll tell you a little about where we live. I, of course, am Danny the Dog, purveyor of wit, wisdom, and words. In times past, I’ve captivated and enthralled multitudes with my wondrous tales of taking Andrew for his morning constitutional to the park; however, I’ve been remiss in not regaling my fans with narratives of our stop by the Tiki hut every morning. In a moment, The Adventure at the Tiki Hut, but first the Tiki hut itself. A Tiki hut, for those of you who don’t know, is a structure consisting of four open sides and a pitched roof covered with palm fronds. The Tiki hut at our marina sports a refrigerator, a microwave oven and three grills, two gas, and one charcoal. The humans used to congregate there in the evenings and do what humans do—mostly talk. But those humans have moved on to new ports of call. The only humans left here in the marina are like Andrew, antisocial. Nowadays, the Tiki hut is inhabited only on Saturday afternoons. That is when the male humans that store boats here—but do not live on them—come to drink beer and swap lies. They also say they come to get away from their females, but I don’t understand that. I like females, especially human females. On Saturday afternoons when Andrew needs a break from his so-called work (he thinks writing is a chore—for me it’s a breeze), we’ll go to see the humans up at the hut. Notice how it’s always all about Andrew. When he needs a break from writing, we go for a walk, but when I need a break, we stay on the boat! I like Saturdays because I like the guys. They always make a big fuss over me and I get many pats on the head and scratches behind my ears. They’ll say things like, “Is your daddy feeding you enough?” When they do, Andrew always says, “I prefer that Danny refer to me as his Lord and Master.” Yeah right! It’s the other way around and Andrew knows it. But I allow him to save face and say nothing. Andrew will then leave me with the guys and go back to our boat. I told you he was antisocial. However, I like hanging out with those males; they have such funny stories of how their females make their lives miserable. I know that the stories are not true because no female would ever do that. Now that you know all about the Tiki hut, I can tell you what I wanted to tell you to begin with. There are two cats that live here in the marina and they hang out at the Tiki hut. They are what humans call strays and the humans have banded together to feed them. They take turns buying cat food. Andrew even bought some . . . once! The cats are fed in the morning and in the evening. It is the morning feeding that interests me. On our way to the park every morning, we swing by the Tiki hut because by then the cats have eaten and they always leave a little for me. I love cat food, as anyone would. Wet or dry, but wet is better. It’s the only way Andrew can get me to take my pills when I’m sick. He tried hiding them in hot dogs, but I saw through his subterfuge and I ate around the pills, then spit them out. He then started to hide them in wet cat food and I would pretend not to notice (hey, I sometimes have to save face too). I just love wet cat food so much that it’s worth swallowing a pill to get some. I’ve gone far afield from what I wanted to say. It’s simply this: Every morning, I eat the little food the cats leave in their dishes. It’s dry, but so what. The only problem is that it is on a table about three feet high and I’m only two feet high. So I have to get up on my hind legs to get to it. You would think Andrew would help out and put the bowl on the ground for me, but nooo! Alicia (she’s the female that feeds them each morning), when she is around, will put the bowl on the ground for me, but not Andrew. That’s it for now. It’s Saturday and I’ve got to get ready to spend some time at the Tiki hut with my friends. And that damn duck is back . . . gotta go! Oh yeah, I almost forgot—go out and buy Andrew’s book and make the old man happy. This is Andrew again. On behalf of Danny and myself, I would like to thank Johanna for having us over. It’s been a real pleasure. Andrew Joyce left high school at seventeen to hitchhike throughout the US, Canada, and Mexico. He wouldn’t return from his journey until decades later when he decided to become a writer. Joyce has written four books, including a two-volume collection of one hundred and forty short stories comprised of his hitching adventures called BEDTIME STORIES FOR GROWN-UPS (as yet unpublished), and his latest novel, RESOLUTION. He now lives aboard a boat in Fort Lauderdale, Florida, with his dog, Danny, where he is busy working on his next book, YELLOW HAIR.